Hey there! Just 28 days to go before the start of filing of applications for the Board Licensure Examination for Psychologists and Psychometrician 2018. How are you guys doing? I know most of you are already enrolled on review centers, some are believing that they can do it on their own while others are thinking if they could really make it to the exams given that they have other priorities at work. I may be one of the latter. But might as well study. Again, I was an aspirant way back 2014 but was not able to pursue the exam due to my job. Now, 2018 is another chance to finally start moving towards this goal - that is to pass the BLEPP and be a Registered Psychometrician. 1. Make sure you have taken all the subjects included on the BLEPP. If you missed one like me, you have to attend classes and have your updated Transcript of Records at the ready. In our curriculum (BS Clinical Psychology), Industrial Psychology is not included. So, I have to enroll on the graduate program to earn the required units. 2. Make sure to request a TOR from your school with your picture printed on it and with Special Order number. In my case, my alma matter is exempted in issuing SO number so I have to go to CHED and get the Certificate of Authentication and Validation. 3. Prepare the rest of the requirements like NSO birth certificate, marriage certificate if applicable, cedula, NBI clearance and Good Moral Certificate from your school, church, barangay or employer that is notarized. 4. Once your requirements are ready, you now have to wait for the go signal of PRC. While waiting you have to start your review! Aside from what was retained on your mind for the past 4 years of studying Psychology you also have to take our all your Psychology books, handouts, outlines and notes because that will be your weapon. You have to refresh them. Lucky the Board only included 4 subjects: Ab Psych, TOP, IOP and Psych Assessment. I have heard from board passers that you really have to prepare for Psych Assessment because it is the hardest subject. If you think you will need help and that your background in Psychology is not that comprehensive you can still enroll on Review Centers. There are some who are still accepting attendees from crash courses, distance learning and digital reviews. But in my case, I am not yet sure if my schedule would allow me to take the licensure exam this year, I will stick with my own reviewers and resources and study on my own. 5. Keep working within your goal, meaning do not stop reading and re-reading your references. You still have 123 days left before the BLEPP 2018. Focus on your review and make your own study plan. If you need study tips check my previous post here. 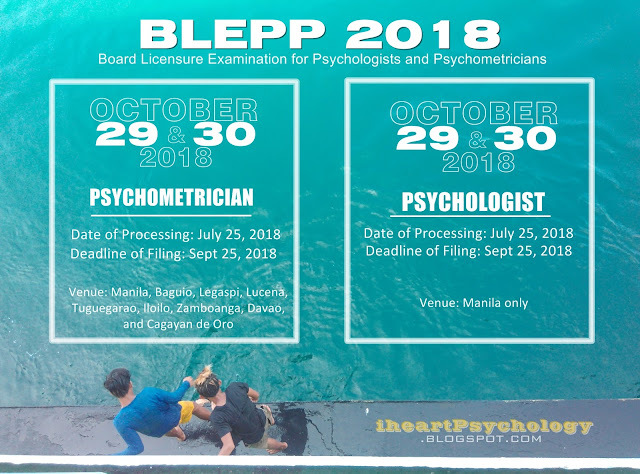 Let me know if you are one of the hopefuls this 2018 Board Licensure Exam for Psychologists and Psychometrician. I want to hear from you. What about the requirement for psychologist board examinations? Is it the same with psychometrician? Tomorrow, July 25, 2018 is the start of submission of requirements at PRC for the BLEPP 2018. Are you ready? Mam repeater po ako pwede ko po ba gamitin ung s.o ko na ginamit ko last year? Thanks for the reply..
Hi! May I ask if tinatanggap po ng PRC yung personal copy na nbi. Na-submit ko na po kasi sa employer ko yung other copy. Salamat po. Hi! As far as I know, it is okay to submit the personal copy of your NBI as long as it is still valid. If ever nman na hindi PRC staff will let you know whe they assess your requirements. Pagka-save ko po ng info, nakalagay po doon na pwede na daw po ako pumunta sa prc. Ok na po ba yun? May iba po kasi akong nababasa na dapat may account po muna bago mag online application using LERIS.Salamat po and pasensya na haha. Hi! Honestly I am not familiar yet with the online application of PRC because I too haven't taken the board exam yet. But based from what I have searched, LERIS is the Licensure Examination & Registration Information System that PRC is using right now. If you have registered (have registered your account) thru this link: http://online1.prc.gov.ph/ I think you are on the right track. After securing your account, you have to fill in necessary information then pay for it and go to PRC with your requirements on the date that you are scheduled. I graduated last 2011 as AB Psychology and I want to take an exam is it allowed. Coz in our curriculum, itneeds to have MA before taking the exam. Please enlighten me. Thank you.